We’ve been working on this this all-natural hand balm for a few years. Our journey started when we were looking for a simple solution that protects hands and aids healing. We didn’t like messy lotions, and many left our hands greasy. Hornet’s Rescue works best when it is slightly warm. We DO NOT recommend placing it near a stove, oven, fireplace or any other open flame. Instead place it in a sunny area to warm it up. We’re out in the field, so a few minutes on the truck dash does fine. 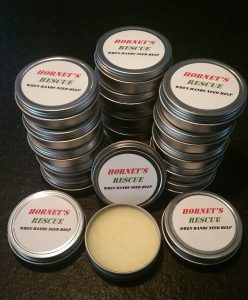 Wash your hands and gently rub in Hornet’s Rescue. It will appear shiny at first, but in a few minutes it will sink in and begin to heal and protect. We recommend using it twice a day in the beginning. Then decide based on your results. $5 per tin. Contact us @ products@finfollower.com. We accept check and PayPal. 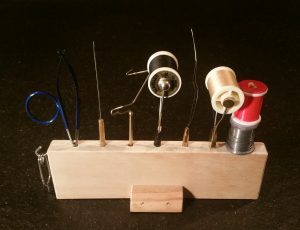 My first simple tool caddy was made for a fly tying event I was attending. I’m not organized enough to lay my tools out on a table, and I don’t like anything hanging off my vise stand. I don’t carry a lot, so I don’t need a large container on the table. It holds scissors, bobbins, a whip finisher and a couple of spools. It has a hook to hang hackle pliers. To my surprise, a few people were interested in getting one. I made a few to satisfy the demand and have a handful of extras that I am selling here. Made of wood, they are 8” long, 2 ½ “ tall and ¾” in width.They hold 6 tools, 2 bobbins and have a hook for hackle pliers. They have been lightly sanded but unfinished. You can varnish, paint, stain or otherwise customize to your specifications. They come in handy and are easy to carry with your other fly tying materials. $10 plus S&H. Contact us @ products@finfollower.com. We accept check and PayPal. 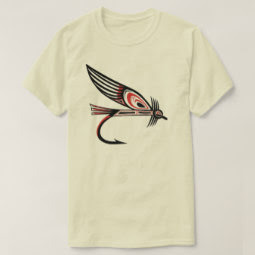 I’ve always been intrigued with the design style of the pacific northwest indians. This Haida-influenced pattern. Comes in several colors. Contact us @ products@finfollower.com. We accept check and PayPal.